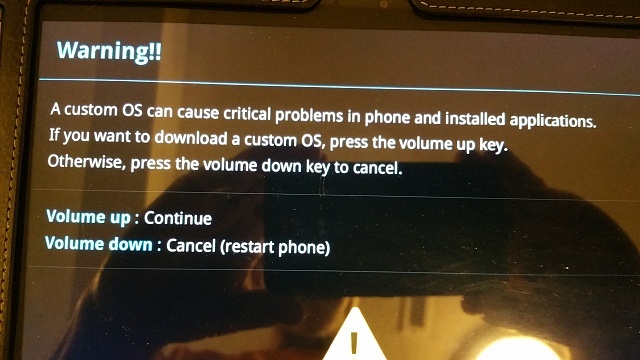 Was checking out the factory reset using power on/volume up/menu button and when prompted to press up to continue or press down meant to press down and instead pressed up which threw up the downloading screen do not turn off. It has been running for over an hour and no change and want to know if it is really down loading or stuck. Tablet is WIFI version and had KITKAT 4.4.2 on it. Wait out the download if working? I have plugged in the charger so it does not run out of power while waiting. Just hold down Power button until tablet restart and thats only way to get out of download mode. It begun when I found the tablet trying to restart, but being stuck on the "SAMSUNG" banner. Then I tried to reset it, but instead of the two icons, it went directly into ODIN Mode. If I try to restart it (holding the power button), the all begins again! Dunno what to do now. i am having the same issue did you find a fix?? "Press and hold the Power button until the first Samsung logo appears (Splash screen) , then release. When the second Samsung logo screen appears, press and hold the Volume down button. Continue to hold the Volume Down button until Safe mode appears in the lower left corner of the screen." I have exactly teh same problem .. did you ever find a fix ? Did this ever get fixed and if so how. My tablet just did the same thing this morning. Try to hold down the power button until the tablet turns off. If you cannot turn off, remove the back cover and disconnect and reconnect your battery. To eliminate the problem of a stuck Volume button, turn the tablet on without the back cover. Hold the Power and Volume Down buttons will make it reboot. Brilliant! Who would have thought that? A bunch of dots! Beut is right. I just had the same issue and pressing buttons together didn't get my tab3 out of Odin mode...I can get into Odin mode but not out of it. Take off the back (run a credit card around the edge of the screen/back - fiddly but should come off if you persist). Unclip the battery lead (white plastic thing with 6 red/blue/black leads going into it, and leave it off for 10 secs or so. Reclip the battery lead back in, then it should reboot as normal when you press the power button. You can leave the back off while you do this just in case, then clip it back on once you know your tab is working. I've done this before when I had the black screen of death for unknown reasons, and once when the battery was nearly dead and it wouldn't restart - taking the battery lead off seems to be a general reset trick. So far it's worked every time when my tab goes gaga. Don't be frightened of taking the back off...there's nothing connected to the back and it WILL clip off if you loosen all the edges - the corners are the difficult bit. And I forgot to say - there are vids of how to take the back off your tab on the net if you look (sorry can't remember where I saw it), just in case you're wary of doing it. When you've done it once, you know it's easy and you won't break anything. The insides of your tablet are pretty uninspiring TBH. Disconnected the battery but same situation as folks above. Tried flashing but not yet results. Stuck as a rock. Same prob, stuck in Odin mode for two years. Somebody from Samsung please help us. Same problem here. And one this starts happening, I can't turn it off - I'll get the white "Samsung Galaxy Note 10.1" words on the screen, briefly hold the power button to turn it off, the screen goes blank... but it's fooling me, the words return. I can only get to that or the "downloading - do not turn off" screen - which I left it at for several days, and I've come to the conclusion that it ain't downloading s**t. Tried the unplug-the-battery thing, no resolution. Called Samsung, that was a huge waste of time. After getting passed around to multiple people (with bad connections and very difficult-to-understand accents) who kept forgetting that it's a tablet, not a freaking phone - each would assure me that worst case scenario, I could send it in for repair. Lo and behold, the last guy goes thru this whole rigamarole, only to finally tell me it's too old, I can't send it to them for anything. I'd just like to get it up & running long enough to download my pics & documents. Has anyone come up with a solution??? 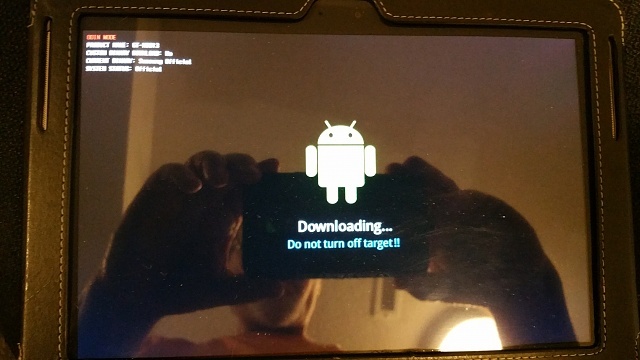 I have the Galaxy Tab A 10.1 SM-P580 and the only way I found to get out of download mode was to press down both volume buttons (up and down) at the same time, along with the home button, and then press and hold the power button until the screen turns black, which was about 10 seconds for me. Hope this helps someone! Does 64GB really cost manufacturers so much more to put in 2014 phones? how do you like the headphone audio quality?